Run-of-the-mill Firefly fans wear knit Jayne Cobb cunning hats. On their heads. Firefly superfans dress themselves as Jayne Cobb’s hat. And accessorize the look with the distinctive eye-glint of a sliiiiiightly crazy person. Via Reddit, who thinks high school year book photos have changed a lot since he was in school. Okay, now this costume is completely over the top, but I have to admit, it makes me laugh, which I think is what the cosplayer was going for. I love it (and would never ever wear it). Points for originality and for the amount of time it probably took to construct, and huge kudos for bravery in actually wearing it. Let your Freak Flag fly! It was so nice and soft, too. I got to see this costume up close. 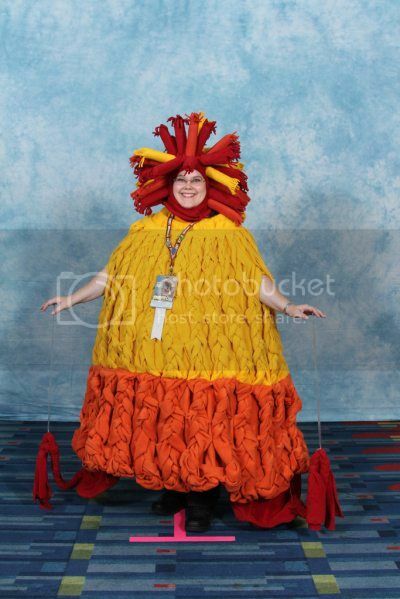 So at first glance I thought she was dressed as a turkey, for Thanksgiving or something, no, this is much crazier. I thought she was a candy corn at first, which means she could decapitate her costume and get another one out of it. This is adorable btw. Just I imagine very warm to wear.